In March, I was honoured to be the wedding photographer for Kirstie and Michael McAllister. Knowsley Hall is by far, one of my favourite wedding venues to photograph. With the landscaped view over the lake, this wedding venue takes my breath away, every time. I’ve chosen 35 natural moments, including 2 of my favourite signature portraits to tell their story. During the morning Kirstie, felt the nerves set in. She woke at 5am with butterflies, but felt so excited for the day ahead. Kirstie had her gorgeous daughters distracting her from her morning nerves, whilst her parents and Maid of Honour helped her get ready, with Michelle from Rachael Bottomley, Manchester Make-Up Artist, on hand for her bridal hair and make-up. Kirstie’s wedding dress and tiara, were stunning which are from Wife to Be in Widnes. Whilst her Bridesmaids dresses were from Monsoon. Michael said he felt like the Harlem Globetrotters were performing a routine in his stomach, resulting in him being ready before his best man and grabbing a quick beer, all by 9am. Kirstie and Michael arrived in style at Our Lady Immaculate & St Joseph Catholic Church in a Rolls Royce Ghost, from American Pie Limousines and a stunning Horse and Carriage from the Ostler. Kirstie started to walked down the aisle, with the church music playing. She saw Michael turn around and as soon as their eyes met, her stomach was flipping with excitement and nerves. With wedding flowers arranged by Champagne and Flowers, who also helped Knowsley Hall decorate the candelabras and tables, it all looked beautiful. During their evening, after the speeches and gorgeous food that Knowsley Hall catered, their first dance was one of their memorable moments. However, I think their 3 year old daughter stole the show, as she started singing, word for word of the lyrics, in the corner of the dance floor. Everyone ended up watching how cute she was. Kirstie & Michael, she is a credit to you both. 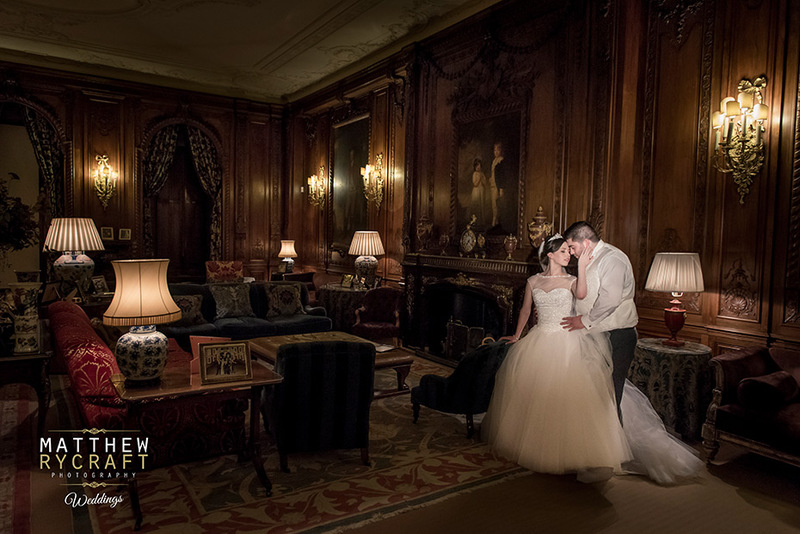 They both said, “Knowsley Hall went above and beyond to make our day what we wanted it to be. The staff, in particular Wayne and Matt, made us feel like VIP’s from start to finish. The location could not be a more perfect wedding venue and we are incredibly lucky to have such beautiful grounds on our doorstep. The food was lovely from canapés right through to the evening buffet and our guests were all complimenting the quality of the food”. Kirstie also mentioned, that when organising your dream wedding, you can hire a venue, DJ, caterers, cars and a photographer, but it’s the people that make a wedding. Their guests were truly spectacular and everybody looked like they had a blast.